The medical outreach organized and financed by the All Progressives Congress (APC) gubernatorial candidate, Alh. Gboyega Oyetola which started about 10days ago will be brought to close tomorrow, Wednesday October 19. The medical outreach which has attracted thousand of people from all nooks and cranny of Osun State will also give attention to as many people who are willing tomorrow. 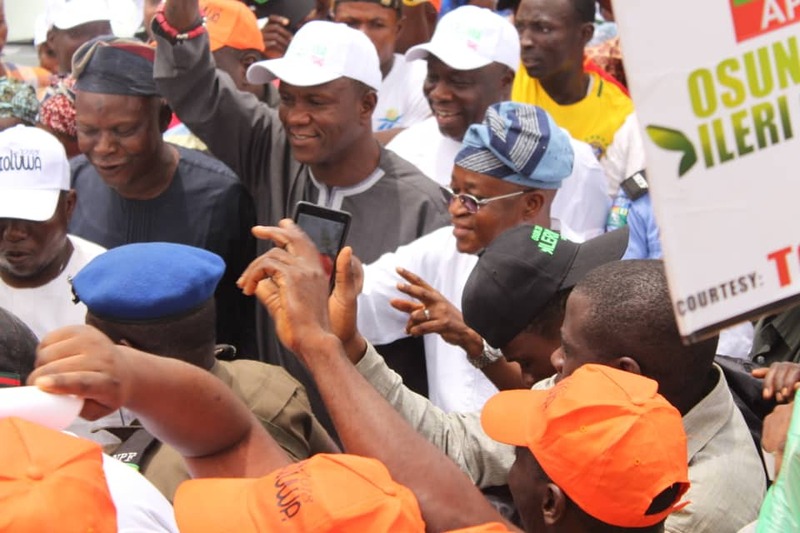 So far, 10 communities had benefited from the intensive free medical outreach of APC gubernatorial candidate, Alh Gboyega Oyetola and has testified to the quality of health services rendered. The outreach which has put smile on over 30, 000 persons face across the state will be brought to closing tomorrow in Osogbo. According to the statistics from the medical personnel of Ilerioluwa, Surgeries 570 was done, 172 eye cataract was operated and 27, 567 persons had enjoyed general medical treatment. The team posited that they are still expecting no less that 5,000 people in the grand finale of the medical outreach. It could be recalled that the flag off of the the outreach commenced at Ejigbo with the attendance of honourable Minister of Health, Prof. Isaac Adewole, Alhaji Gboyega Oyetola, Speaker of the state house of Assembly, Rt. Hon. Folasayo Najeem Salaam, Commissioner for health, Dr. Rafiu Isamotu, The CMD OAUTH Ile ife , The CMD LAUTECH Teaching Hospital , Dr Simeon Afolayan Chairman Osun Health Committee and other important dignitaries.